The market environment for office real estate is looking positive. As part of the economic recovery, employment growth has increased significantly, which, in turn, is reviving demand for office space. While the inner office markets of the large urban centers in particular are recovering, the outer office markets have hardly seen any change yet. 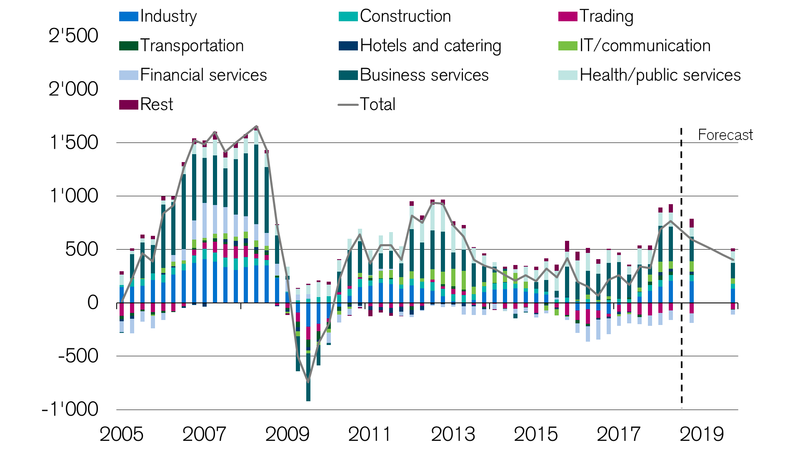 The Swiss economy performed exceptionally well in 2018. This has affected the employment rate in Switzerland. Especially companies in the corporate services sector, but also in the health and information technology sectors, experienced strong employment growth this year. In addition, the industry sector is showing an increased rate of employment. This is in contrast to reduced employment in traditional office sectors, such as financial services, wholesale trade, or telecommunications. In these sectors, which hold a large stock of office space, the employment figure in the last year was reduced by over 10,000 jobs. Consequently, these sectors have needed less office space. But at the same time, demand for office space is being supported by numerous sectors that need a lot of office workstations. Structural changes on the labor market and cyclical employment growth ultimately lead to higher demand for office space. The construction of new real estate remains appealing thanks to the continuing low interest environment, low financing costs, and limited investment alternatives. However, the number of building permits for office spaces in the large and medium-sized urban centers has decreased, whereas in the outskirts, the municipalities are seeing increasing construction activity. Building permits in the outskirts, which amount to CHF 753 million, are even exceeding the sum of those in the large urban centers. Building permits, sliding 12-month sum, in millions of Swiss francs. 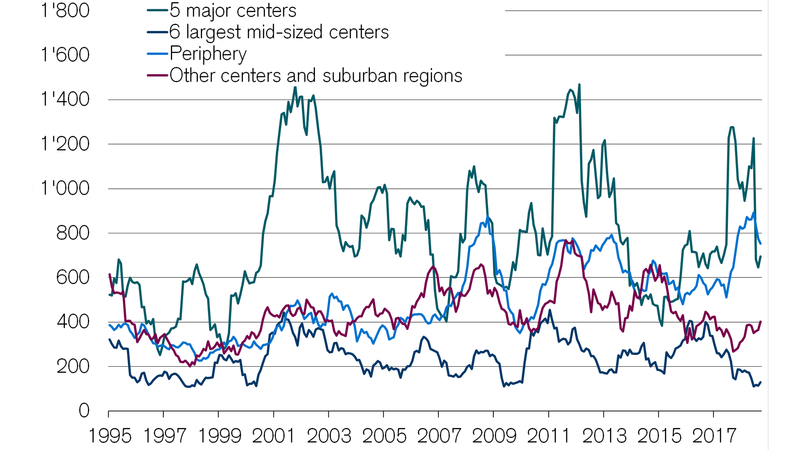 A recovery is particularly apparent in the inner office markets of the large urban centers. The office spaces available for rent there have already been reduced by nearly a fifth. In Geneva and Zurich, this positive development has also affected the medium-sized office markets. Availability has nonetheless continued to rise overall, because the recovery is hardly noticeable in the outer office markets, with the exception of Lausanne. Many new spaces have been developed in the area due to low interest rates. Depending on the large urban center, 50% to 80% of the spaces offered are therefore in the outer office markets, which leads to more vacant spaces there. The Credit Suisse study "Swiss office property market study 2019" presents the current developments in the Swiss office real estate market. Find out why the office market is on the road to recovery and what other office real estate developments can be expected in 2019. The effects of high supply in the outer office markets are reflected in the rental prices. 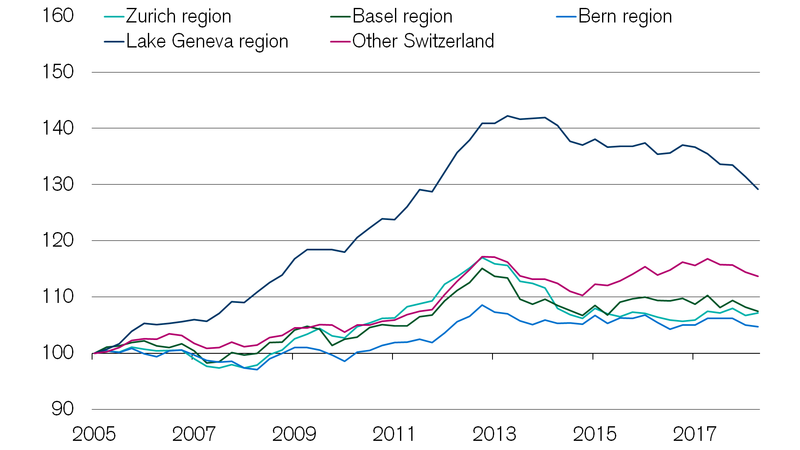 In most regions of Switzerland, the rents have fallen slightly compared to last year. The revival of the demand side should, however, put an end to rental price reductions in the medium term. An exception to this is Geneva, where rental price reductions are likely to continue due to the structural change and the large increase in vacant properties – particularly in the outer office market. The outlook for the office real estate market for 2019 forecasts that despite a likely settling in the Swiss economy in the coming year and an expected slowed growth rate, the situation in the Swiss labor market should improve further, and thus the recovery in the office market is set to continue. However, it is still unclear whether the economic recovery will be enough to also ensure that the many available spaces in the outer office market are absorbed. On the other hand, prime locations could see some shortages and rising rents again, so the rental price gap between the center and outskirts should clearly increase.